Southerners Black hoist the trophy after winning the Cup final at the 2018 Chris Kays Memorial Rugby Tournament. Finally the day had arrived and despite some last minute problems, particularly with the weather being very uncooperative, the fabulous new facilities of the Rugby School were ready to be christened with the opening games of the Chris Kays Memorial 10’s Rugby Tournament. Held over the weekend May 5-6, this was to be the 18th staging of the tournament but the first at Rugby School. Given the long history of the game at the mother school in England, the players taking part here had a lot to live up to. A storm and heavy downpour had rendered the playing surface on the show pitch more like a swimming pool than a rugby field and the ground staff performed near miracles to produce an excellent playing surface and despite several sharp showers during the weekend the tournament ran without a hitch. Jim Howard (left) and Nigel Westlake (right) present the Chris Kays Award to Alex Jezard. These minor problems could not of course deter the teams that had gathered on Friday at The Retox Soi Lengkee, part of the Retox Group and the hottest spot for watching sport in Pattaya, to sign up for the tournament. The tournament participants arrived from all over Thailand and other parts of the world to contest what has now been established as one of the principal 10 a-side tournaments in the region. The tournament was to be contested by 16 teams with a very strong local bias. Reigning champions Royal Thai Police were determined to retain their title and had brought a very strong squad containing several Thai national players. Other former champions, the Phuket Vagabonds and the Southerners and the resurgent Bangkok Bangers were also expected to make a strong challenge. The quality of the overseas teams was not known but the Tequila Mocking Birds from Hong Kong are a revered touring side throughout Asia and had entered two teams, so they were expected to be among the leaders. 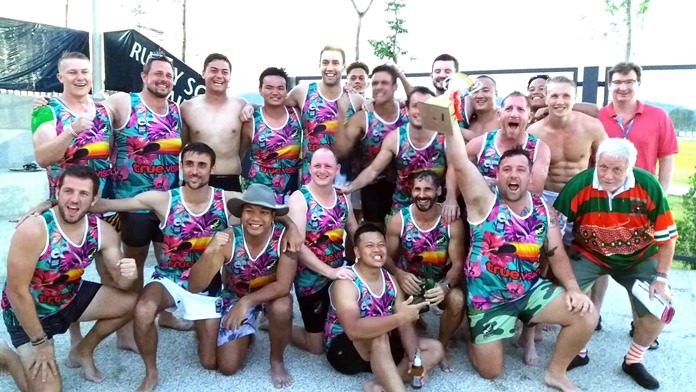 Hong Kong had further representation from Hong Kong University Rainbows and they were joined by the Hong Kong Scottish, who were returning for their fifth year. 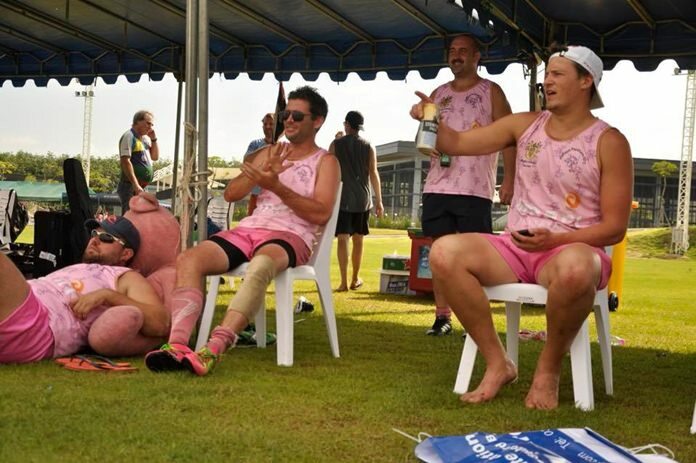 There was a welcome return to the tournament for the Stray Cats from Darwin and whilst they were not expected to challenge for the top trophies they were guaranteed to be very entertaining. For the first time we also welcomed The Shiny Rahus (AKA Phnom Penh Social Club) from Cambodia while those great tourists the French Asian Barbarians (FABS) were bound to bring plenty of colour and gallic flair. Nigel Westlake, Headmaster of Rugby School (right), presents the Plate to the French Asian Barbarians. The roster was rounded out by host club Pattaya Panthers, whose playing staff had been training hard under the watchful eyes of coach “ Animal “ and welcomed the return of former coach “Stout”, who has recently returned to these shores and was hoping to get a run out as well as add his advice to the team. The teams were divided into 4 groups and after Saturday round robin games to determine the rankings, the various squads reassembled on Sunday for the knockout stages and finals. 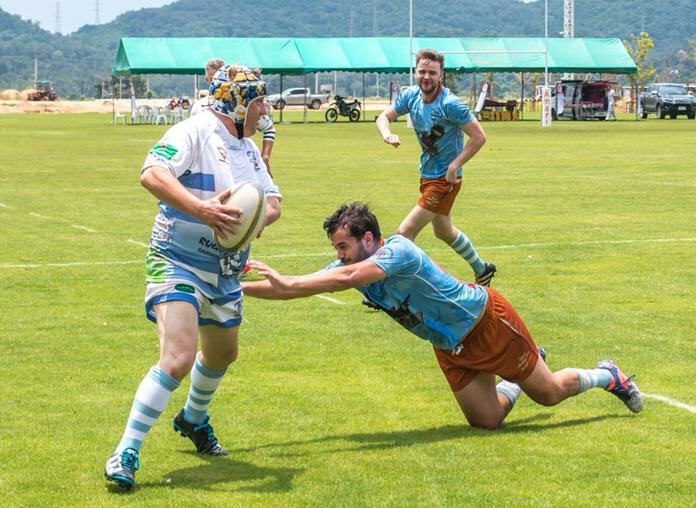 No way through for Hong Kong Scottish against the Mocking Birds. The now well-known trickle down format was in effect, putting the ‘Big Boys’ on early and giving the others a slightly later start. The previous night‘s partying had definitely taken its toll and tired limbs were anointed and strapped as the quest for Cup, Plate, Bowl and Shield got under way. The Cup quarterfinals saw some very good and hard games and, as expected, the Royal Thai Police accounted for the Tequila Mocking Birds while Southerners Black eased past the Bangkok Japanese. 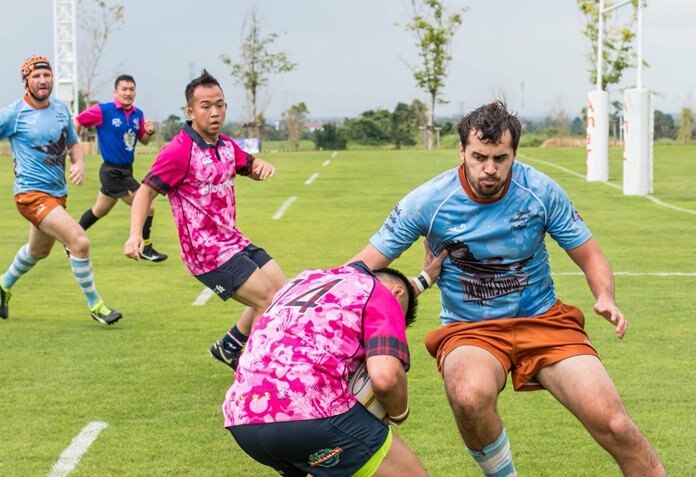 The Bangkok Bangers then overcame the Tequila Mocking Birds Fledglings and the host Panthers won a close encounter with Hong Kong University, who then withdrew to catch early flights back to Hong Kong. The Stray Cats try some expansive rugby against the Fledglings. 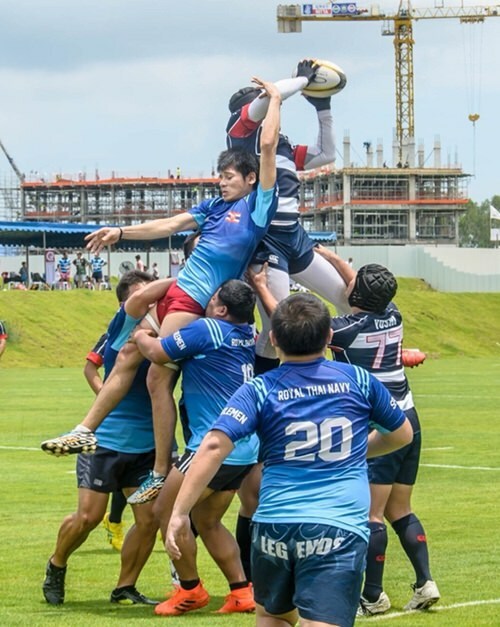 The first time losers then dropped into the quarterfinals of the Plate led by the Bangkok Japanese and the two Tequila Mocking Birds squads. The Plate quarterfinals were also hotly contested as teams were finding their appropriate level of competition. 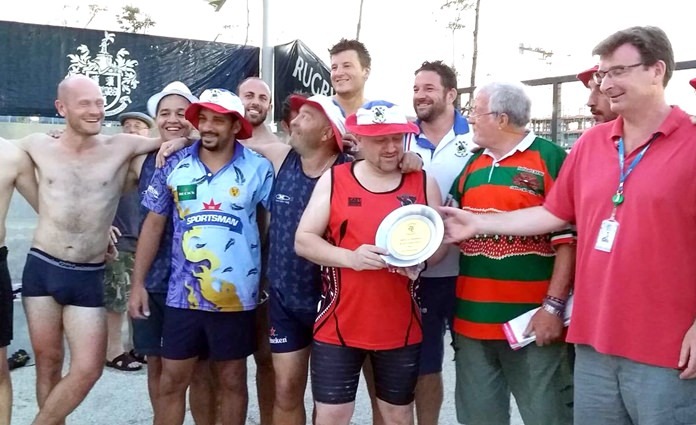 Southerners Gold received a walk-over and Bangkok Japanese, Elephant Brutal and the pastis fueled FABS moved into the Plate semifinals. The lineup for the Mike Cobb Bowl was to produce possibly the most entertaining rugby of the weekend and featured an absolute classic comedy performance from the Stray Cats against the Tequila Mocking Birds Fledglings. The older and heavier Cats decided that running was not in their repertoire and the spectators were treated to “dead ants”, “statues”, “short lineouts”, “20-man mauls” and “piggy back tries”, and at one stage even the referee was taken into the scrum. As the final whistle approached with scores even the Cats were in a great position to take the winning try, however they contrived to pass to the opposition winger and then wave him through to score against them. A Fledgling runs into the Police defence. 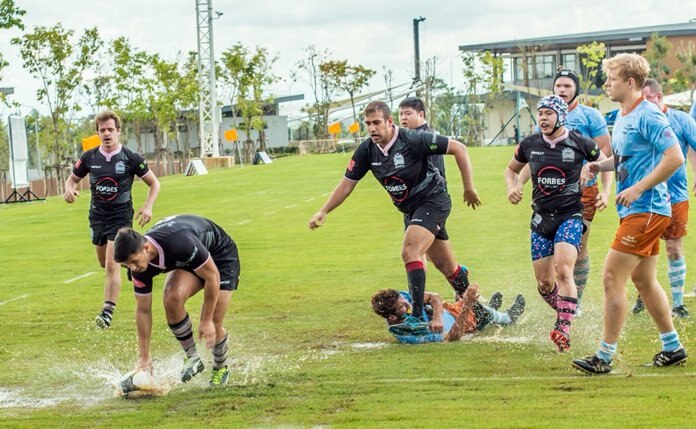 The Phuket Vagabonds easily overcame the Shiny Rahus and Hong Kong Scottish accounted for the senior Tequila Mocking Birds, with Bangpoo given a walkover by the early departure of the Hong Kong University. 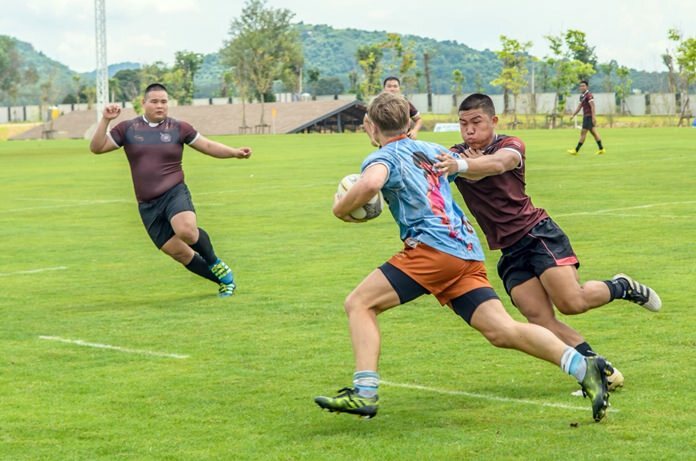 Both semifinals of the Cup were hotly contested and the Royal Thai Police showed just what a potent force they are in Thai rugby as they coasted to a relatively easy victory against the hosts Pattaya Panthers. The second semifinal was exceptionally hard fought and the Southerners Black team attacked and attacked against the Bangkok Bangers, who defended as if their lives depended on it. 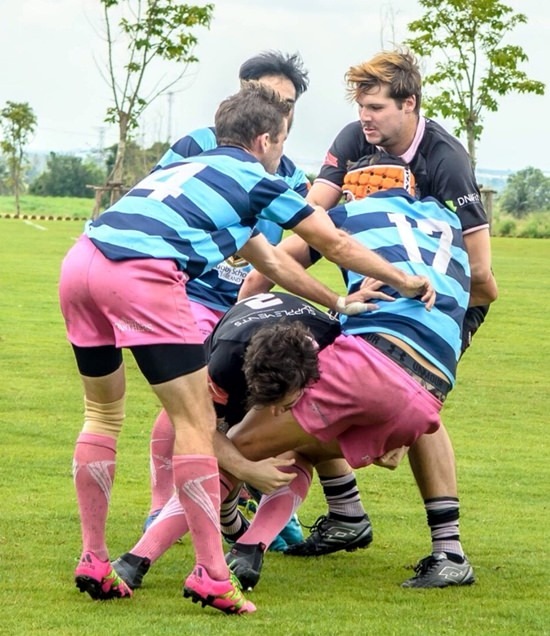 This time the Bangers finally ran out of steam and Southerners Black regained the bragging rights for Bangkok expat teams as well as a place in the final. Damp conditions couldn’t stop the quality rugby on show. The finals round began with the Shield match between the Tequila Mocking Birds Fledglings and the tournament comedians the Stray Cats. The crowd was entertained to another classic display of coarse rugby as the Cats pulled all of their stunts and could well have won the game, but that is against the ethos of their rugby. The Fledglings entered into the spirit of the game and for bringing a touring party of 46 they fully deserved a trophy and were rewarded with the Shield. Before the final of the Mike Cobb Bowl competition a minutes silence was held in remembrance of Mike and other absent friends who have gone to the great rugby club in the sky. Mike’s memory lives on! 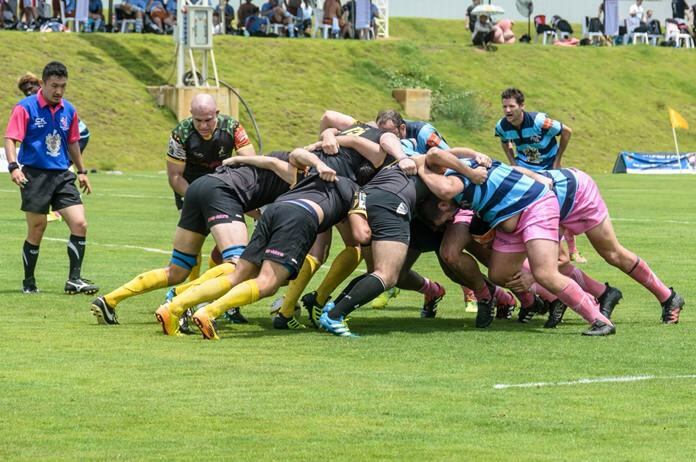 This was a very exciting game and the Hong Kong Scottish made hard work of beating the Bangpoo RFC boys, who never gave up and ran themselves into the ground. It was a trophy at the 5th attempt for the Scottish and they will be back next year hoping to go one better. Scrumdown – the Panthers front up to the Southerners. The Plate final saw another classic display from the FABS, who once again won a difficult encounter against the Brutal Elephants from Surin. The widely travelled FABS produced some Prosecco rugby and whilst the boys from Surin fought hard, the FABS experience got them onto the dais at long last and they now have a plate for all that French cheese. 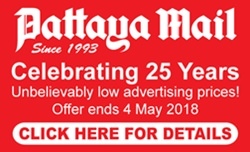 So the stage was set for a classic Cup final between the youth and fitness of the Royal Thai Police, the reigning champions, and the age, experience and weight of the Southerners Black, whose sister team Gold had last won the Cup in 2015. No quarter on the field as teams gave their all. The match started at a frantic pace and the Police played some scintillating rugby, whilst the Southerners defended resolutely. There was nothing to choose between the two teams and heading to the final whistle it was all evens. Then the referee deemed that there had been foul play in the maul and a Police prop was given his marching orders. As the clock wound down the Southerners were able to seize the initiative and the extra man proved decisive as they scored the winning try with almost the last play of the match. Both teams put on a magnificent display of hard running rugby and both defences stood firm. So the Southerners Black gained revenge over Royal Thai Police and regained the trophy that their club had last held in 2015. All hands to the pump at the lineout. After the final whistle everybody crashed into the pool and presentations were made to all trophy winners. The highlight was the presentation of the prestigious Chris Kays Award after a gap of three years. This award is made to the person who is deemed to have contributed most to the tournament, both on and off the field through their good sportsmanship and conviviality. The award this year went to Alex Jezard, the tour leader of the Tequila Mocking Birds who did a magnificent job of marshalling a tour party of 46. Nigel Westlake, the Headmaster of Rugby School gave a farewell speech to the departing players and thanked everybody that had taken part in the tournament for playing the game as it should be played. The Southerners perform an impromptu haka. 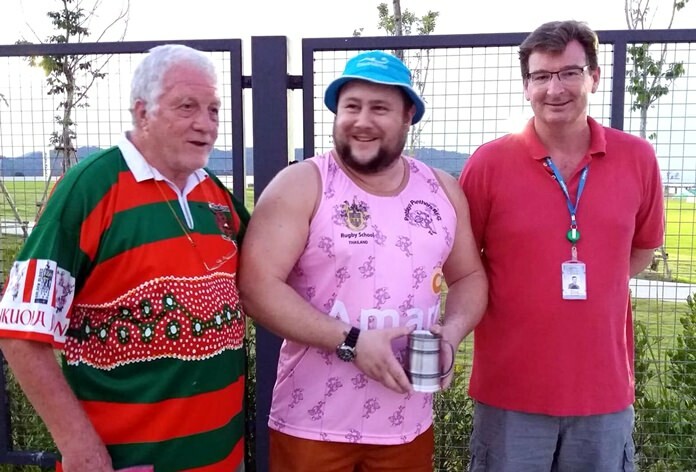 Jim Howard, the Chairman of Pattaya Panthers RFC, commended everybody for the great spirit in which the tournament had been played and the outstanding quality of rugby throughout, despite the weather’s interference. A vote of thanks is due to all the organizers supporters and sponsors without whom a tournament like this could not happen. Major plaudits go to Rugby School Thailand for the provision of the magnificent facilities and Retox outlets for good food and drinks, Amari Orchid Resort, still with the fabulous Mantra restaurant, WHA Hemaraj Land and Development, The London Pie Shop, Bakri Cono Shipyard, Premier Solar Co. Ltd., Phoenix Pacific Inc., The Baron Devereux, Societe Generale de Surveillance, MAS Ausgroup, DSL Ltd. Paul Music, Garden International School, Chang for the beer, and media partner Pattaya Mail. Players enjoy a break from the sidelines. Also a heavy vote of thanks go to Contract Resources Asia, who provided all of the shade, Drinking 4U all the drinking water and customized bottles, the Sawang Boriboon Foundation for the standby ambulance and first aid and medical team, David Viccars the referees supremo who kept everybody under control (even the referees) and thanks also to Tournament Director, David “Animal” Slater and Ron Keeley, the IT wizard who produced another superb programme. And a final thank you to everybody who supported the tournament this year and made it such a great event. We hope to see you all again next year!